The F-Open competition was very close right down to the end, and the conditions were unforgiving. Shiraz finished with a 1226-55X score, one point ahead of F-Open runner-up Freddy Haltom (1225-60X), who had high X-count among Open-classers. 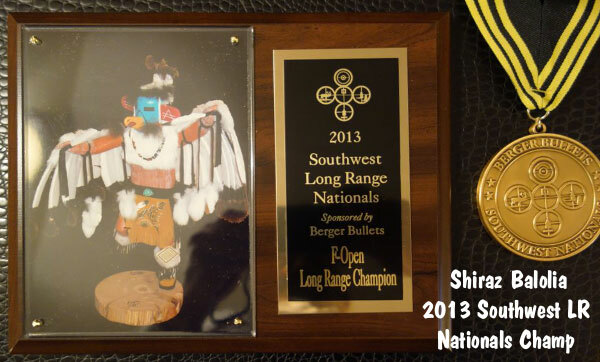 We’re told that Shiraz was using a “shoulder-busting” .300 Win Short Mag in Phoenix. We’ve been promised photos of Balolia’s winning rig as soon as Shiraz gets back from Arizona. In the F-TR division, John Hayhurst shot well throughout the Nationals to finish first with 1210-25X. Runner-up Lige Harris had 35 Xs, but ended six points down, finishing with 1204-35X. James Crofts, a past F-TR National Champion, finished third with 1203-24X. In F-TR Team Competition, the new Michigan F-TR team coached by Bryan Litz proved to be a powerhouse, securing an impressive team win. Shooters were: Al Barnhart (captain), Doug Boyer, Bill Litz (Bryan’s father), and Dale Sunderman. The second- and third-place teams were both USA F-TR Development squads. USA Team Blue grabbed second place, while USA Team Red took third. We’re told that USA Team blue set a new F-TR Palma record on Saturday. However, Team Michigan came back with a big win in Sunday’s 1000-yard team match, securing the Team Aggregate title. In F-Open division, we’re told that Team UHaul finished first, with great shooting by Matt Davis, Herb Edwards, David Gosnell, and David Mann. Team Tex-Mex was second, with strong performances by Bryan Chatwell, Freddy Haltom, Ben Milam, and Cory Bizzel. Team Grizzly ended up third despite a cross-fire in one match. 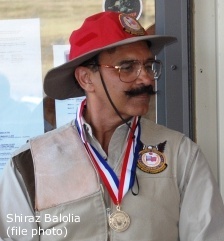 Team Grizzly is composed of F-Open winner Shiraz Bilolia, Emil Kovan, John Myers, and Tony Robertson. 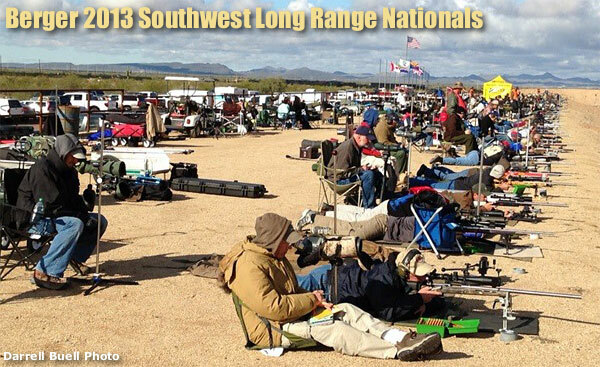 Share the post "Match Results: Berger Southwest Long Range Nationals"
Here’s a great promotion if you need an affordable target scope or variable-power hunting scope. Weaver Optics is now offering substantial rebates on Weaver T-Series target scopes and V-Series hunting scopes (16-power and above). With this offer you can get $75.00 back on a 24X or 36X T-Series target scope, or $50.00 off a Classic V-Series varmint scope. 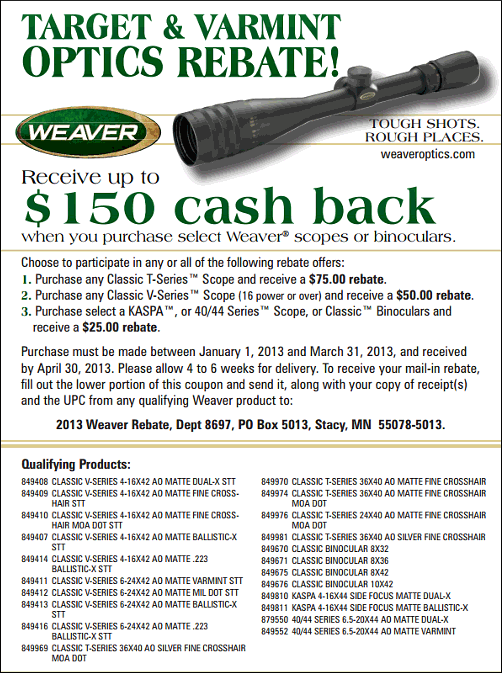 In addition, there are $25.00 rebates on Kaspa and 40/44 scopes and Weaver “Classic” Binoculars. The Weaver T-Series 36x40mm scope remains a popular and reliable benchrest scope that is still found on many top competitors’ rifles. The T-24, 24-power scope is popular with rimfire shooters as well as many “paper punchers” who don’t need 36X magnification. Since both scopes share a 40mm objective, the 24X version has a larger exit pupil, which makes head position less critical. Both 24X and 36X T-Series scopes have front-adjusting objectives for parallax control. Share the post "Rebates on Weaver Optics — $75.00 Off T-Series Target Scopes"